My colleague Jim Moody sent along this interesting graph. He took all papers cited by an ASR, AJS, or Social Forces publication since 1999. 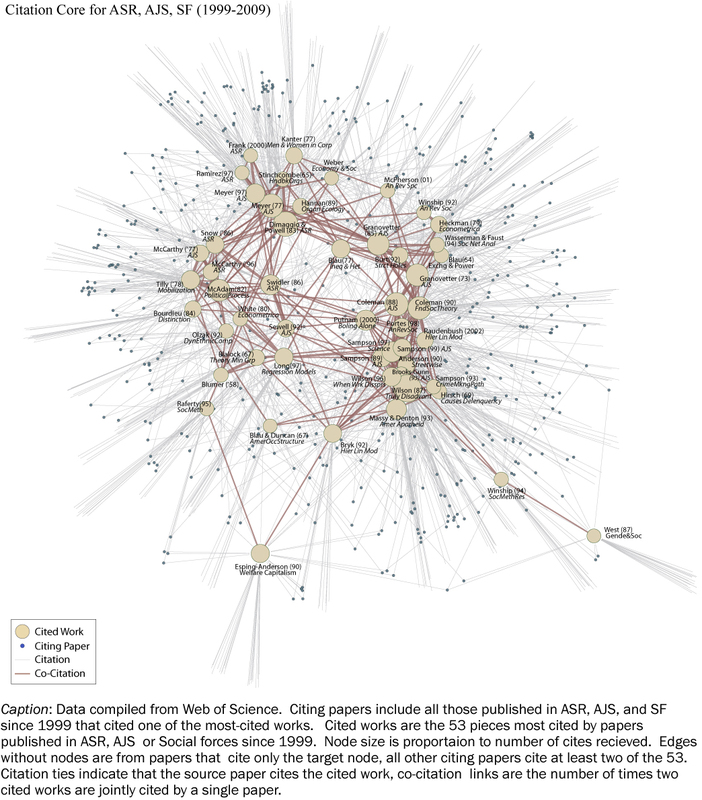 He then mapped the top 50 such citations (actually 53, because there were some ties) as a citation and co-citation network. Here’s the result. Some quick observations. First, reading anti-clockwise from the right, it looks like the core of the field is Stratification, Networks, Organizations, Social Movements — and HLM methods. Second, despite Sociology’s alleged inability to forget its founders, only one piece of work in the Top 50 citations was published before 1965, and that’s Weber (1922). Third, it’s great that the visualization shows Swidler (1986) and Sewell (1992) right where they belong — trying to bridge structure (on the right) with agency (on the left). It’s interesting that HLM methods show up so prominently. Is the method a stand-in for soc of education? this implies the counterfactual of why isn’t there more direct affinity between, say, orgs and strat, only a shared interest in networks and social movements? i would say that there’s an obvious brokerage opportunity here but a lot of people (eg the Bielbys) /have/ tried to connect orgs and strat, apparently without much success. Do I understand, though, that this is all citations in those journals; not just economic sociology or organizations, right? If so, “we” form much more of the core of the field than I would have expected. Kieran (and Jim):Thanks for sharing this picture. It’s great! Sean: One path to influence is to create an easily transportable idea. Org theorists have done pretty well: isomorphism, ecology, fields, etc. Movements is another: framing. My shock: where is social psych? I only see Blumer ’57. Admittedly I don’t recognize all these works solely by author and year, but it looks like gender only has one of the 50 cites. If memory serves, there’s also strikingly little in the way of family or “narrow” demography that I recognize (I’m not a demographer and could be missing things). In the case of demography focused on fertility etc., could this low citation level be because works are more time-sensitive and become out of date faster – or just because demographers publish more n their own journals? And could the lack of citations to really old theoretical stuff be largely because people simply pick different years/works to cite? (If I’m citing one of Marx or Weber’s famous papers, there’s probably a dizen diferent ways/years/editions I could cite the same piece, all correct). Anyway, neat graphic. Sean and Fabio – Another interpretation is that although orgs and economic sociologists are a fairly low proportion of the entire ASA, they work in high status areas of study and therefore are more central to the overall field than you would expect. Wow, well done! Would be really interesting to see that graph evolve over time, e.g. top 50 each year. It’s interesting that social exchange shows up in the networks cluster of cites. I suspect that if you generated the same type of graph in the OB journals (AMR, AMJ, ASQ, OS, JAP, etc. ), you’d find social exchange would have greater betweenness centrality. Does this sort of analysis take into account time since publication and/or “size” of subfields (i.e., are there just a lot more papers and books in some areas than others?)? If not, would controlling for these change the picture? And use Sonia to make a movie of the top 50 over time! @Jordi – sonia looks good. I’ve never used it before, but I expect to change that. Thanks for the pointer! shouldnt Candace West’s “doing gender” 1987 in the right bottom refer to Don Zimmermann too? or is meant a different paper here? Brayden: I think the prominence of HLM cites is due to the prominence of neighborhood effects research and not a stand in for sociology of education. Two of Rob Sampson’s four nodes were co-authored with Steve Raudenbush for example and I think the method is standard in quantitative urban work at this point.